Come and have Fun with a capital F at the Fruitstock festival ! We had a fantastic time last year. It’s in Regents Park, London on the Saturday the 6th and Sunday the 7th of August – so just round the corner. Omlet’s chickens are already looking forward to a day out in the Royal Park. We’ll be there with eglus on show and you can come and have a chat about the joys of chicken keeping. 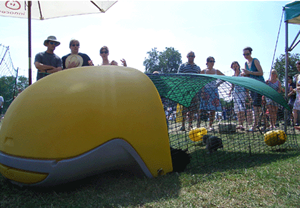 And of course this year we will also have the rabbit eglu to show. You can find out more information about Fruitstock at www.fruitstock.com. I grow various different fruits, vegetables and herbs in the garden and this year I’ve tried a little experiment. All the droppings from the chickens go straight into a compost bin and have been making the most wonderful compost over the last few months along with additional peelings from the kitchen, weeds and some garden clippings. I planted half of my runner bean seedlings in large tubs on the patio and the rest in the garden. Those in tubs have had a generous amount of this wonderful homemade compost while the garden ones have been left to grow in our rather ropey soil. The difference a couple of months on is quite staggering. The runner beans in pots have lush green foliage and many bright red flowers waiting to be pollinated by the visiting bees while the garden ones look rather sparse and to be honest, a little weedy. I’m looking forward to a bumper crop from the tubs this year! Several of the keen gardeners on the Omlet forum also make a liquid feed by filling a bucket with water and adding the droppings to it. This is then sieved after a while and watered onto the plants which apparently show outstanding results too. Not only do the hens provide us with the most wonderful eggs on the planet but they also save us a fortune by providing us with free garden fertilisers and compost! Never underestimate the value of chicken poo! How easy is it really to clip a chicken’s wing – should I get the vet onto this when the time comes? 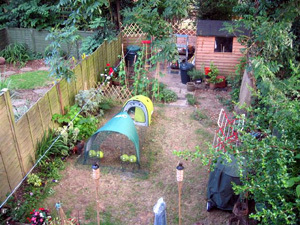 Can foxes scale 6ft garden fences and, if so, how much of a problem is this likely to be during the day? If I let them free range will they completely destroy all my plants? I’m not a fanatical gardener but I do prefer my fuchsias with blooms than without! Have you noticed that there aren’t many frogs about? According to tradition this means that August will be hot, good news if your off to the beach but don’t forget your chickens! This full cover for the run will provide your chickens with complete shade whilst they are in the run ensuring their comfort. And if it does rain they won’t get wet – spoil your chickens? You’d never do that, now where are those grapes it’s time for their afternoon treat!